Odds n Ends Used- "the yard sale"
The major diameter leading into the treads is smaller on this version to ensure a better fit to the custom action bolt handles. This is the BUG NUT barrel nut for use with the Savage small shank, Bighorn, and Mausingfield actions with 1.06"x20 tenon threads. This nut is designed for barrels with a breech of 1.20" or smaller. This is the BUG NUT barrel nut for use with the Savage small shank, Bighorn, and Mausingfield actions with 1.06"x20 tenon threads. This nut is designed for larger breech barrels with a breech of 1.20" to 1.25". Atlas, BAT, and others with 1.06"x18 tenon threads. 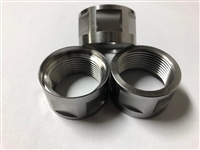 This nut is used for barrels with a breech of 1.25"
This is the BUG NUT barrel nut for use with Remington factory actions that have been trued by Southern Precision Rifles. 1.075"x16 tenon threads.